Animal Control legally confiscated more than a dozen goats, two sheep and two rabbits. Last year, Santa Cruz County Animal Services director, Todd Stosuy noticed a cow with a broken horn spraying blood a foot in the air. The shocking sight led him to an even more tragic situation - a custom slaughterhouse. Goats, rabbits, pigs, chickens and other animals subsisted off of bread and tortillas. One goat was down, others were extremely emaciated. The owner claims the animals were for religious ceremonies and, as such, did not need to be stunned insensible to pain before having their throats cut. Animal Control legally confiscated more than a dozen goats, two sheep and two rabbits. Unfortunately, California law did not permit the confiscation of the hundreds of remaining animals, all of whom are most likely dead by now. Animal Place accepted six goats and two sheep. 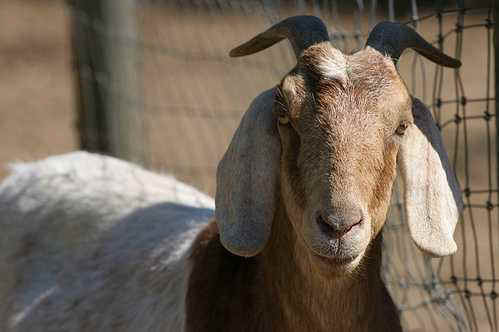 The remaining goats and cow were sent to Farm Sanctuary. The animals were in varying degrees of poor health. Because of their poor diet of inappropriate feed, all the goats had various degrees of hoof and leg problems. We lost one goat. Another was so lame, she could only get around by crawling on her front knees. The two sheep were very thin, bones poking through wool. Most of the goats had overgrown hooves. 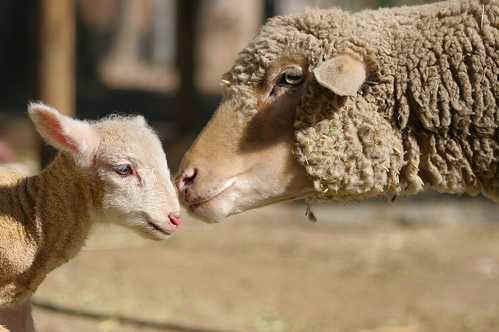 Two animals were pregnant, one giving birth to twin kids, the other to a beautiful male lamb. The district attorney decided to press charges against the owner, an incredible thing, all things considered. Dogs and cats are low on the prosecutorial totem pole, let alone goats, sheep and cattle. Unlike so many other cases, the defense soon learned that all the witnesses called - from the director of animal control to our own Abby Patterson, sanctuary supervisor, well, they all showed up. Even the USDA inspector who was to testify on a video of an improper slaughter arrived. The defense decided to take a deal. The owner, Efrain Toledo Martinez, pled no contest to two counts of animal neglect. That is it. He has to pay $190 in court fees and $868 to Santa Cruz Animal Services. Animal Place alone exceeded $1,000 caring for these neglected animals. Of course we do not save lives because their care is paid for, but there is a disconnect in how much it really costs to make health more than a dozen sick, emaciated animals. We are, of course, disappointed. Justice was not served, not by a long shot. We are grateful that the district attorney decided to pursue charges against Martinez. And a big thank you to Todd Stosuy & Santa Cruz County Animal Services for rescuing these animals...few animal control agencies can claim to have that much respect and compassion for farmed animals. So how are all the animals doing? Lucy, the goat who was so lame she had to walk on her knees is now living in Santa Cruz with C.A.P.E. A vet diagnosed her with severe laminits and, after complete removal of grain from her diet, Lucy now walks without a discernible limp. She even lets guardian, JP, hand-feed her - something she would never do a year ago! Millie, Adele and the two babies she gave birth to at the sanctuary, Todd and Tess, live with a wonderful couple in Arizona. They drove all the way out to California to adopt the four goats. We've heard reports that Millie gets to come into the house and that Todd is a little bit of a head-butter. Annie is very shy and wants nothing to do with people. She was polite enough to stand still for this photo, though. Annie and Jessica remain at Animal Place, far too shy for adoption elsewhere. They integrated easily into the current herd. The two are like sisters, spending most of their time together and calling to each other when separated. Etta, Virginia and the lamb she gave birth to, Lenny, are doing okay. Lenny is more than a year old and looks all grown up! He still spends a lot of time following his mom around. Etta hasn't gained much weight, so she's still skinny - we think it's because she's a really old sheep lady. She loves her back massages. Of course, everyone should check out one of the first tender moments Virginia and Lenny shared - nose to snout mom and son.